Cross-slab, Doid Mhairi, Port Ellen. View of Viking-age cross slab. Stone in National Museum of Scotland (IB 196). Cross slab. Doid Mhairi, Port Ellen, Islay. 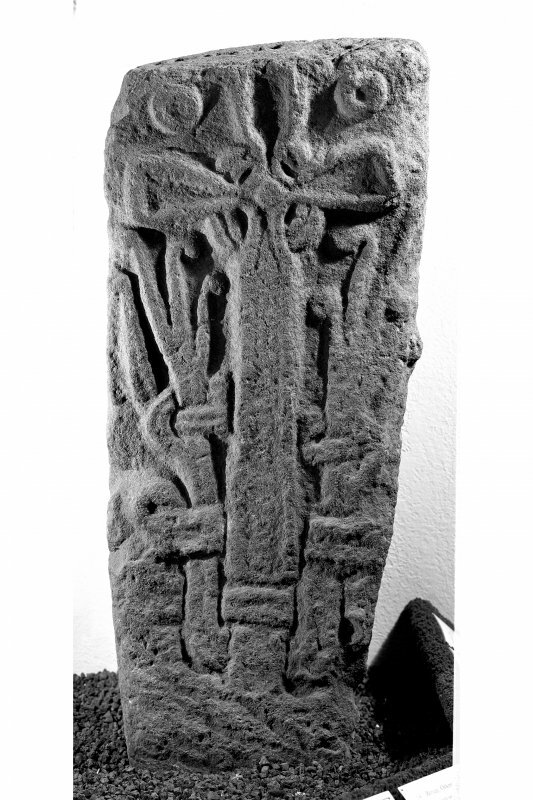 A cross slab, in the Norse 'Ringerike' style, dating from a little after 1050 (Stevenson 1961), was found at what may have been a chapel and burial ground at Doid-Mhair (NR 357 458), Mary's Croft, about 1838. It was donated to the National Museum of Antiquities of Scotland (NMAS) in 1923. The site, described as being of the size of a small potato plot or garden had been preserved in an otherwise cultivated field, because of its resemblance to other burial places in the area. A considerable quantity of stone lay in it and there was some indication of a building or enclosure. Donald McNab, was clearing the stones, in order to bring the area into cultivation, when he found the cross slab which measures 33ins by 14ins across the top. The cross, ringed and fluted, is flanked by disorganised triple ribbon interlace and what are said to be representations of the sun and moon. In 1883 Donald McNab indicated the find spot to Mrs Ramsay in a large park about 300yds west of Port Ellen distillery (NR 359 457) and north of the limekiln at the side of the road (Tighnaathaoil- House of the Limekiln - NR 3573 4578). No other objects or burials have been found either on the site or in the field. Proc Soc Antiq Scot 1883; Proc Soc Antiq Scot 1923; R B K Stevenson 1961; (undated) information from Mrs Ramsay, Kildalton. 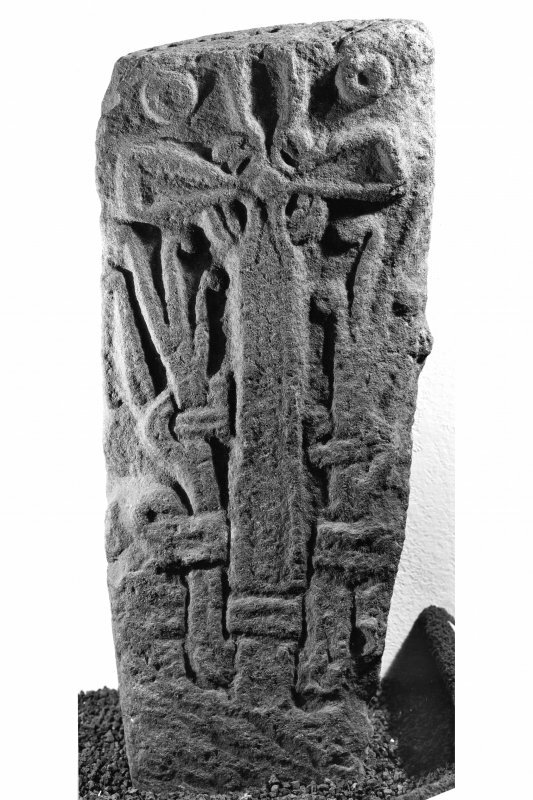 This cross-slab was discovered about 1838 during the clearance of Doid Mhairi ('Mary's croft'), a small uncultivated area in a field about 200m W of Port Ellen Distillery, lying at an elevation of about 7m OD and some 150 m from the N shore of Port Ellen Bay. The area had been used for field-clearance, and 'some appearance of an enclosure or building' was reported, but no burials were found. The slab was preserved in the grounds of Kildalton House until 1923, when it was presented to the National Museum of Antiquities of Scotland. is carved in low relief with a ring-headed cross having deep hollow armpits and splayed arms. At the centre of the cross-head is a small disc or boss, and the edges of the cross and ring are wrought with continuous bead-mouldings. Above the arms are two discs with sunken centres, probably representing the sun and moon. The foot of the cross passes through an irregular plait of double-beaded bands which flank the shaft and bifurcate at the top to form tendrils with lobed terminals. These tendrils have been identified by R B K Stevenson as a characteristic motif of the 'Ringerike' style of Scandinavian art, and the slab may be attributed to the second half of the 11th century.2 (NMAS cast IB3, on loan to Museum of Islay Life, Port Charlotte. There is no trace of any structure in the area of the map reference given above. The site falls within a pasture field. Visited by OS (BS) 6 June 1978.